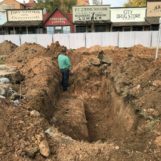 DODGE CITY, KAN — The Boot Hill Museum staff recently made a discovery of a buried object on their grounds, as they began preparing for construction on a new exhibit building. The object was a 2,700-pound vault that was buried 46 years ago. The vault has served as a time capsule, but had to be dug up four years before it’s 50th year due to the ground breaking of the new building. The building will go right over where the time capsule was discovered. There is a plaque on the Boot Hill grounds noting the location of the time capsule, but museum staff wasn’t able to find anything near the plaque after multiple attempts of digging. The museum staff then did some more thorough research on where exactly the time capsule could be. They were able to find a photo of the burial that took place in 1972 and knew they had an even better idea of where it was. The digging then began at 11 a.m. on Wednesday morning. Members from the museum staff, as well as other help from various people all joined together to try and locate the vault. Shortly after 2 p.m. they found the spot and began digging around the 46-year old time capsule. The first thing they discovered on the vault was a sunflower. The sunflower still had it’s bright yellow color, even after being buried for 46 years and under thousands of pounds of dirt. The capsule was finally lifted from the ground at 3:37 p.m. and the people in attendance all had a big smile on their face, as they knew that history had been found in historic Dodge City. The capsule will not be opened until Thursday, due to the vault being sealed tight and not enough equipment needed was on hand on Wednesday. The official ground breaking ceremony will take place tonight at 5:30 p.m. at the Boot Hill Museum grounds under the big white tent. The event is free and open to the public and refreshments will be provided. The time capsule and the valuables inside of the capsule will be on display if the seal is broke.